To see OADC's policy on political action and government affairs, click here. To make a donation to the OADC state PAC, click here for the form to mail in your donation. 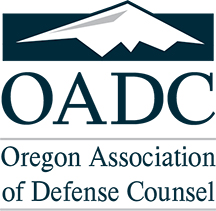 If you have questions about OADC's legislative program please contact our government affairs committee chair, Dan Schanz at [email protected] or 503.585.5555 or our lobbyist Rocky Dallum at Tonkon Torp at 503.802.5757 or [email protected].